Ever wondered what all those ADO, YDO and LC numbers mean when we’re discussing the history of BMC, BL and Rover cars? Worry not, because our exhaustive list of development codes should help you work out what’s what. The XC numbers (signifying ‘eXperimental Car’) were applied to projects headed up by Alec Issigonis at Longbridge. These cars (with the exception of XC9000) all went on to be developed into production cars. After the merger between Austin and Morris in 1952, all subsequent new cars in development were given ADO project numbers. ADO stood for ‘Austin Drawing Office’ – the fact that they referred to an Austin and not a Morris Drawing Office gives some clue as to where the loyalties of BMC chief Leonard Lord lay. Following this list (based on material supplied by the Archive Department at the British Motor Museum) can be confusing because the project numbers were not always in numerical order. In some instances, this muddled system made sense (ADO15, 16 and 17, for instance), whereas at other times, it obviously did not. Look, for example, at ADO77, 88 and 99: ADO77 seems logical enough, as it follows ADO73, 74, 75 and 76, but following that comes ADO88, which was cited by Charles Griffin as being so called because of its 88-inch wheelbase. Following that came the ADO99, which again, possessed a 99-inch wheelbase. Was this pattern coincidence or was it chosen because of its nice, cascading numerical pattern? At the time of writing (July 2017), we are still without an answer to this question. Prototype still exists in Australia. BMC Australia had trodden their own evolutionary path, once left to run with the BMC range of cars, and from 1962 the Antipodean subsidiary decided to use their own code numbers to denote development of cars specific to them. Prototype of YDO1 with raised turret to improve rear seat headroom – not produced. …with Australian wind-up windows, 998cc engine and Hydrolastic suspension. …with Australian wind-up windows, 1275cc and Hydrolastic suspension. Pickup version of the Austin 1800 ‘Landcrab’. Proposed pick-up version of Austin X6 cars (number not used, or not proceeded with). It is rumoured that YDO26, 27 and 28 were allocated to the P76 sedan, station wagon and Force 7 coupe respectively, but were not proceeded with as Lord Stokes decided on the P76 code name. YDO Numbers not used: YDO8, YDO11, YDO12, YDO13, YDO16, YDO17 and YDO20. Based on information compiled by Peter A Jones, Roger Foy and Tony Dingle. To signify the new direction the company was heading following the Ryder Report in March 1975, the single and integrated Leyland Cars division changed the way of identifying upcoming new car projects. This new system was implemented to replace the ADO system employed by Austin-Morris, as well as the fractious and none-too established naming employed by the Specialist Division. The LC prefix stood for Leyland Cars, while LM referred to Light Medium. The Light Medium division came about due to a marketing reshuffle at BL in the autumn of 1979, when the Specialist Division was disbanded. The Light Medium division did not last long, being replaced by Austin Rover in 1980. The LM codes changed on a fairly regular basis, as the business and the company’s relationship with Honda changed, but this list represents those projects actively pursued by Austin Rover. According to different BL/Austin Rover corporate plans, there were also references made to the LM16 and LM17. LM16 was referred to variously as an open-topped version of the LM12 or a hatchback version of LM15. LM17 was another code used in reference to an executive class car, but the re-bodied SD-1 LM15 project was actually seriously evaluated. Unlike the long-running ADO series and the politically sensitive LM series, the more recent development codes never seemed to catch the public’s imagination in quite the same way. Thought to be a rebodied, Roverised version of the Montego, using the M16 power unit, though the existence of this project has yet to be confirmed. Also known as Project Theta. The mid-term facelift which produced the 45 was called Project Oyster. See also X20, below. MG Rover codename for MG and Rover ranges. MG Rover codename for both ranges. Of course, in a company as wide ranging as British Leyland, many, many other projects were given their own names, as it was not until the 1980s that a centralised product design and planning system was set-up. This page includes the one-off project names, plus some of the code series which existed within the individual companies prior to the various mergers. What a fantastic run of information. P6BS looked like an intersting vehicle. Never thought about or seen a Landcrab pickup. Brilliant. Keep the good work and the information coming. Did the original Range Rover have a ‘P’ code ? No, it was simply known as the “100-inch Station Wagon”, referred to as “Road Rover” and designated “Velar” when the pilot run cars were sent out for testing. The second generation Range Rover’s P designation is an interesting one: P38. All sorts of speculation as to what it stood for, but the answer is quite unremarkable – it was the number of the Office in which it was designed! P38A actually – was variously Discovery and Pegasus before that. Pegasus was compromised by a supplier so the name was changed. CB40 (Freelander) followed the convention derived from the Canley location of the project office. I believe Road Rover was another, earlier project. It was the ‘100-Inch Station Wagon’. ‘Velar’ was an artificial company set up by Rover so that prototypes were registered in another part of the country. The best explanation for the name was that it was derived from the Italian for ‘hidden’. If the P6BS went ahead, it was to have been badged as an Alvis and would also have worn Velar badging when prototypes took to the road. No it wasn’t…..the P38 designation originated from a conflation of the MGA Developments code – Mustang – or, you’ve got it, P51….and Block 38 at Solihull, where the program management team were situated. Over the duration of the project, the names were conflated into P38. There was a question raised recently on whether SD4 existed? Was it a cancelled project? 1) The body engineering for ‘P38’ was contracted out to MGA Developments Ltd, of Coventry. MGA gave the project a code name – Mustang. This was very quickly abbreviated to ‘P51’. 2) In parallel, the Land Rover program team at Solihull was housed in Block 38 (adjacent to the famous ‘jungle track’). 3) Eventually the ‘P51’ and ‘Block 38’ references became blended in to ‘P38’. You are correct in saying that the programme team was in Block 38 but only part of it hence ’38A’. I was under the impression that the ‘P’ was simply for ‘Project’ as it was referred to as ‘Project 38A’ within Land Rover. The project was in block 38A this is next to block 38 and right next to the ponds. I worked in here on 38A and T5. I do remember the biw concept brochures from MGA sign P51A Mustang on the cover. 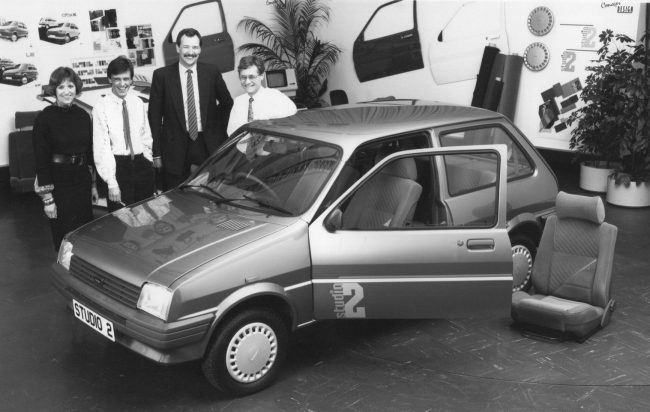 There was previous history P20 rover project was engineered in building 20 at Solihull. You would need to as John Hall for the definitive answer but it is not such a key point in automotive history. I have seen other “ADO” lists and they have errors and omissions, yours is the best I have seen so far. Thanks for including the Australian “YD” codes, there is very little information about them elsewhere. Regards from Michael in Australia. P.S. Did the South African arm of BMC-Leyland have their own development codes? Did the MVI Mini’s have an ADO code? Great article. Am I right in thinking that on another AROnline page I read that ADO stood for Amalgamated Drawing Office though? After the merger between Morris and Austin? After a brief Google search, there are a few sources that beg to differ…..
And they’re wrong. I was a PSF body engineer….all our drawings had two part number boxes in the drawing title block….one was for our PSF part numbers….the other was for the Austin Drawing Office number. R9 (and possibly AR9) was a slightly larger ‘600-type’ vehicle based on R8 but with the 2.0 M-series engine. Unsurprisingly it was an expensive investment, especially when Syncho became a possibility. It morphed into R8 ‘Long Front End’ but some very clever packaging (and miniscule clearances) got the M-series to fit in the standard R8 engine bay with only a small bonnet bulge. Freelander was codenamed CB40, which was named after the building the engineering team were initially mainly based in – Canley, Building 40. Wasn’t R41 used (possibly semi unofficially) for the Rover 75 Tourer? According to The BMC-Leyland Australia Heritage Group book “Building Cars in Australia – Morris, Austin, BMC and Leyland 1950-1975”, YDO13 WAS used – for the original version of the X6 Tasman Kimberley, YDO19 was for the Mark II version only. According to The BMC-Leyland Australia Heritage Group book “Building Cars in Australia – Morris, Austin, BMC and Leyland 1950-1975”, YDO10 was used for the AUSTIN 1800 MkI & MkII Utility and Cab/Chassis models. No mention of MORRIS 1800 Utility! Was there ever an SD4 or was the code never used?